NASHVILLE, Tenn.--(BUSINESS WIRE)--For the second year in a row, Arrow Electronics, Inc. (NYSE: ARW) walked away with “Innovation of the Year” honors last night at the Lean & Six Sigma World Conference, the leading conference on business process improvement. Arrow won for its Lean Sigma Drones project, which combines drone technology, proprietary video technology and a rapid-improvement methodology to observe Arrow’s extensive warehouse operations from a birds-eye view and more effectively identify areas for continuous improvement. The project has already increased the efficiency of targeted processes by 82 percent and eliminated more than 6.5 million walking steps in warehouse processes since Arrow launched it in late 2016. Employee feedback spurred the innovative drone project—Arrow warehouse employees reported it was much easier to observe processes and identify areas for improvement from a higher vantage point. Using drones, they can now see more than they ever could before, and all in 4K resolution. 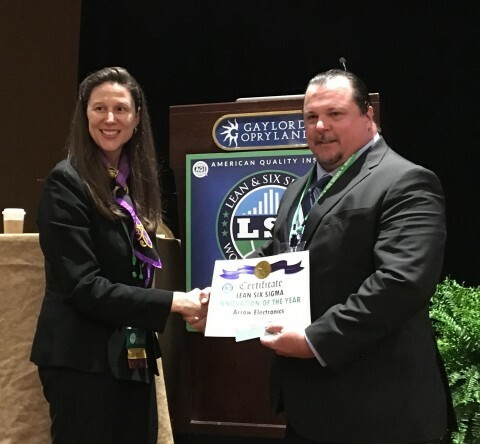 Arrow won the award last year for its Lean Sigma Global Logistics Olympics. Both projects are creating a fun, competitive, continuous process-improvement environment across Arrow’s growing global logistics network and were conceived of by Arrow’s Top 25 Lean Sigma Practitioner Thomas Van Eimeren, who accepted the award last night on Arrow’s behalf. The annual Lean & Six Sigma Conference attracts international and national experts on topics including innovation, process improvement and value creation that play a major role in improving efficiencies, increasing profitability and improving customer experience across a variety of industries. Arrow’s dedicated global logistics services business helps to create a competitive advantage for customers with tailored supply chain solutions, best-in-class global capabilities and excellence in execution. Customers can benefit from improved efficiency, flexibility, scalability and reliability; reduced risk and total costs; and an improved ability to focus on critical priorities while Arrow handles their logistics function. Learn more at www.arrow.com/en/arrow-services/logistics-services. Arrow won the “Innovation of the Year” award last night at the Lean & Six Sigma World Conference, the leading conference on business process improvement. Arrow won for its Lean Sigma Drones project.